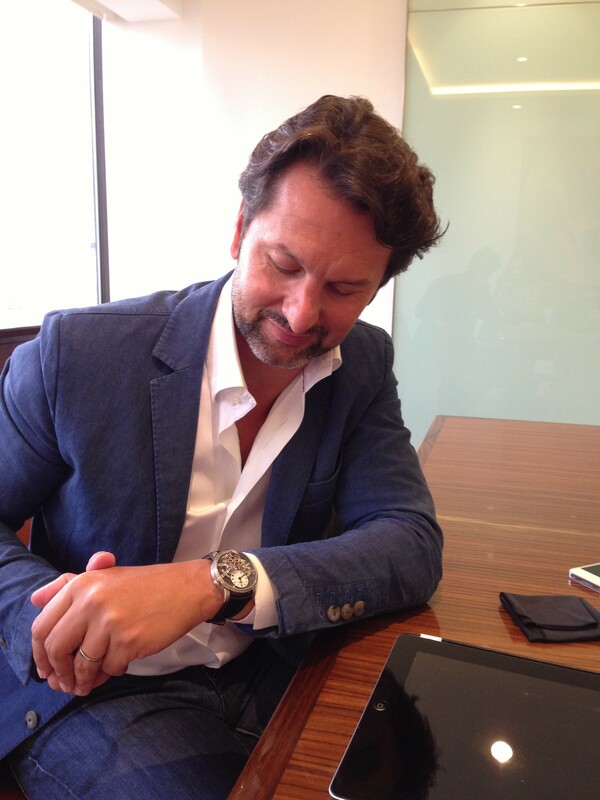 I sat down with long-time friend of REVOLUTION Maximilian Büsser this morning to experience something that quite a few of us in this industry have been anticipating for some time now. 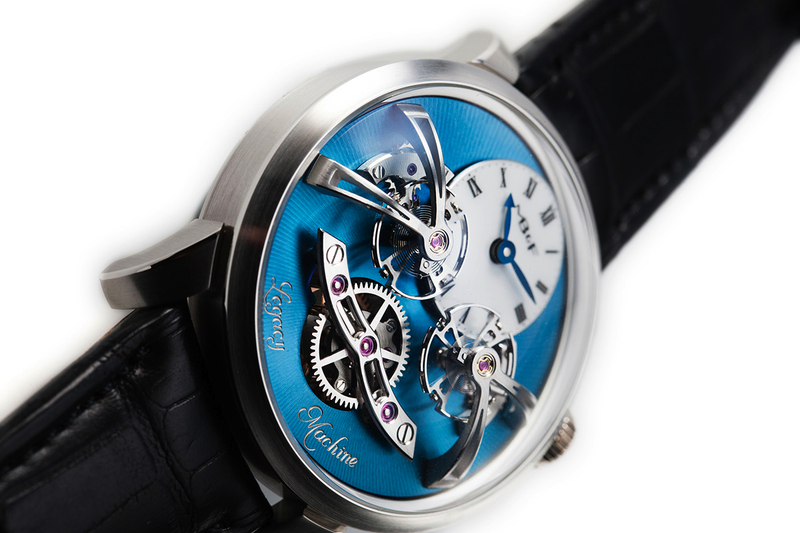 Those of you reading this, it is to be presumed, are already familiar with the watches of MB&F — the Horological Machines that draw inspirations from the various pop-culture influences of Max’s childhood and the Legacy Machine that contextualises these inspirations within a 19th-century aesthetic. Today, I got to meet the Legacy Machine 2, and it was an absolute privilege. Like all of MB&F’s creations, there is something about the Legacy Machine 2 that immediately renders all other background stimuli irrelevant. You no longer hear anything being said to you, you no longer see anyone in the room, the room no longer even feels cold (and the air-conditioning of the room I was in is always locked at sub-zero levels). Because of this, dear reader, because of this. 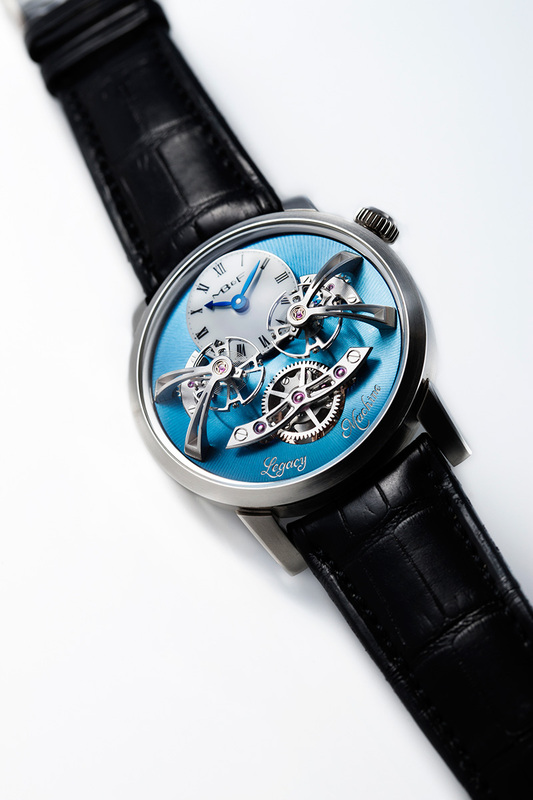 You’ll remember the first Legacy Machine 1, with its double-dial display and balance wheel hovering beneath the sapphire-crystal dial dome like a hallucinatory vision out of a revisionist sci-fi saga. 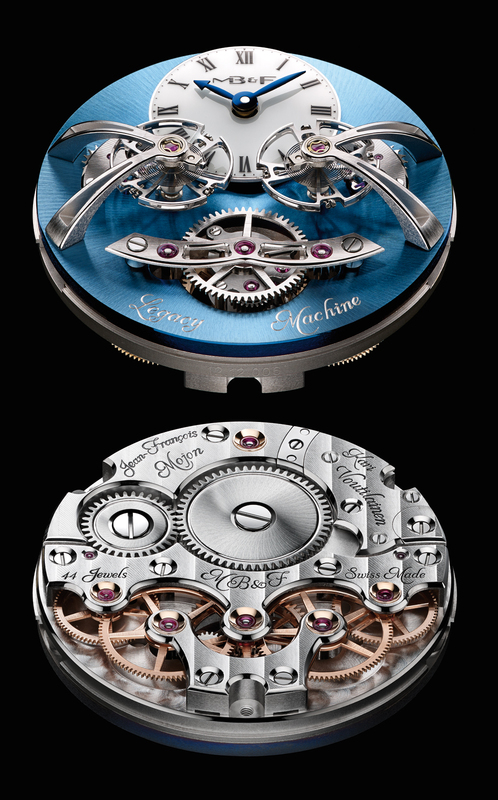 Numbers play musical chairs between the LM1 and its successor, which implements two balance wheels facing off over one time display. The rates given by the two balance wheels (which do not enter into resonance, just in case you were wondering) are averaged by a planetary differential (in other words, epicyclic — again, just in case you were wondering) to give a single time reading. Where the vertical power reserve was in the LM1, the differential now appears in the LM2, held up by a bridge that clues us in to the inspirations behind this watch. That is, if you know where to look. 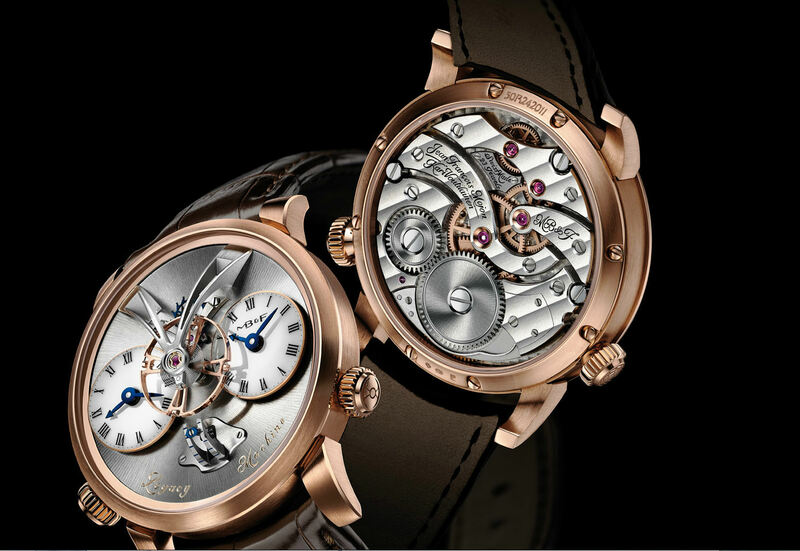 Whereas the LM1 took us back in time to 1867, the LM2 brings us back a little further, to the time of Neuchâtelois chronometer-maker Ferdinand Berthoud (1727–1807), who built the earliest known timepiece with two regulators averaged by a differential. 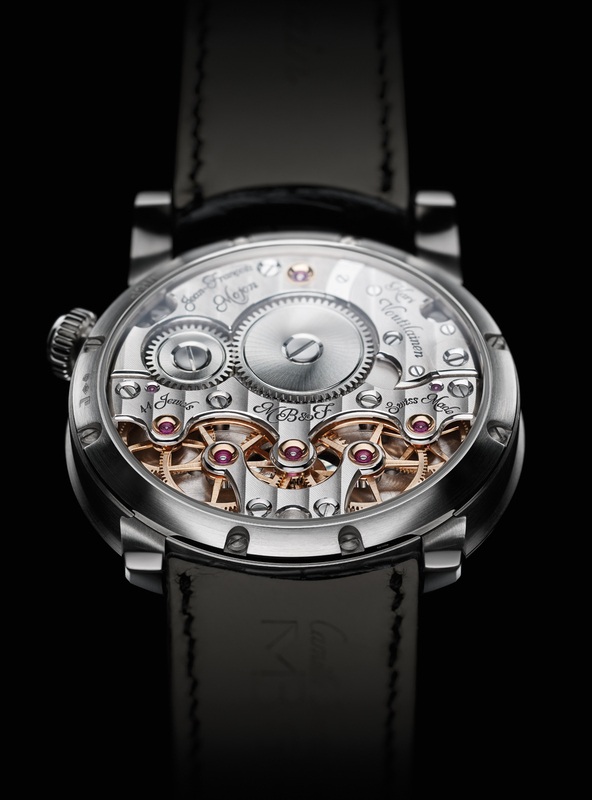 Those familiar with the history of movement construction will notice the acknowledgement that the LM2 makes to this period of watchmaking — the dial-side differential bridge is supported at either end by pillars that evoke the pre-Breguet style of watchmaking. This is what Max and his team do best. For everyone, the Legacy Machine 2 is an overdose of visual spectacle, a sensory banquet at which one is invited to gorge. But hidden in plain sight are rich morsels of historical reference that would tempt even the most jaded connoisseur. I felt like M. Humbert when he first set eyes on the tragic Charlotte Haze’s garden. 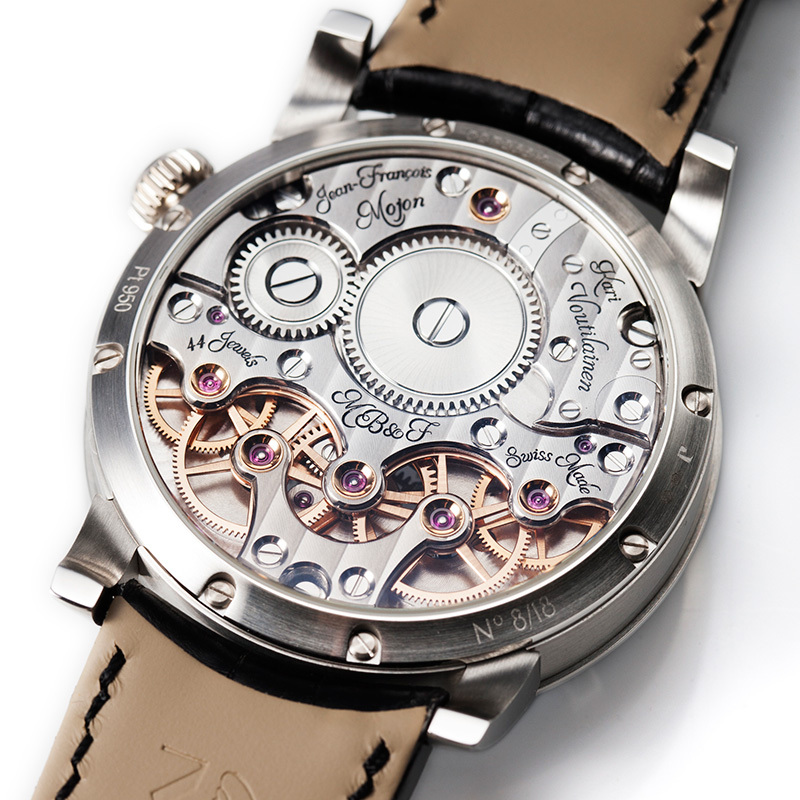 Everyone knows that the redoubtable Finn Kari Voutilainen is an absolute master of finish. (I heard that pun you made in your head about finish/Finnish. If you value a pain-free existence, please don’t ever make that joke in my hearing.) We saw the tear-inducing things he did with the LM1. What has he done with the LM2 movement (“movement” is right, I was so moved I completely zoned out of what Max was saying to me for about five seconds — sorry, Max) but covered the entire base plate with fine, overlapping perlage, except for the circular areas directly under the exposed gears, which are brushed out in a softly glowing snailed finish. The gears themselves are finished with circular graining, with polished bevels. Ladies and gentlemen of the jury, I wept. 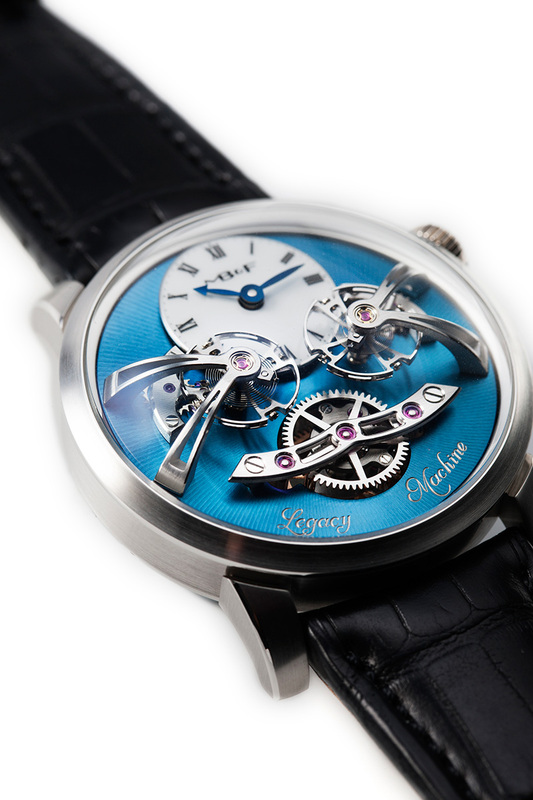 The movement is, once again, accomplished by the supremely talented Jean-François Mojon and his team at Chronode, and both Mojon’s and Voutilainen’s names are inscribed onto the LM2 movement by the steady hands of Eddy Jaquet. Here I am at my last paragraph, but really, I haven’t finished even half of what I wanted to say about the MB&F Legacy Machine 2. I guess it’s okay, though. The pictures can say the rest. That’s what they do. 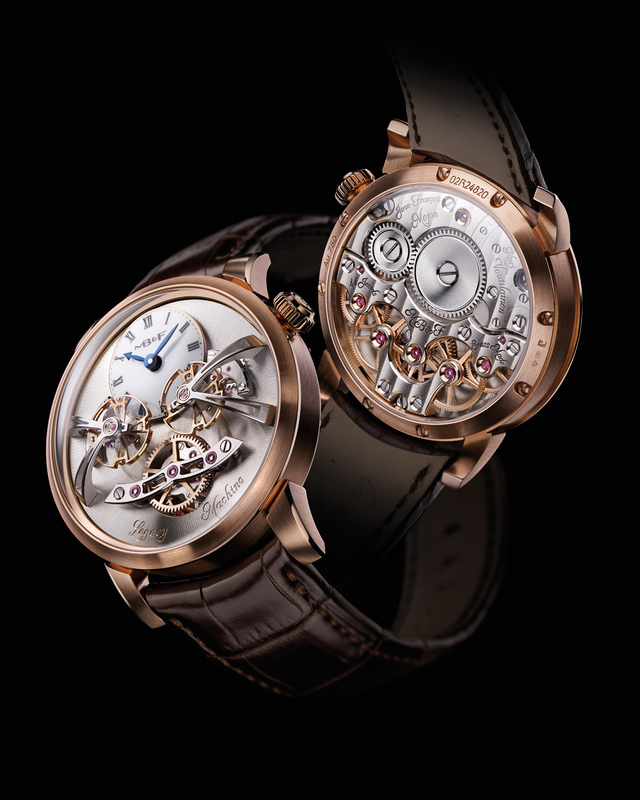 The MB&F Legacy Machine 2 retails at The Hour Glass in Singapore for S$226,000 in red gold or white gold, and at S$275,100 in platinum (limited edition of 18). 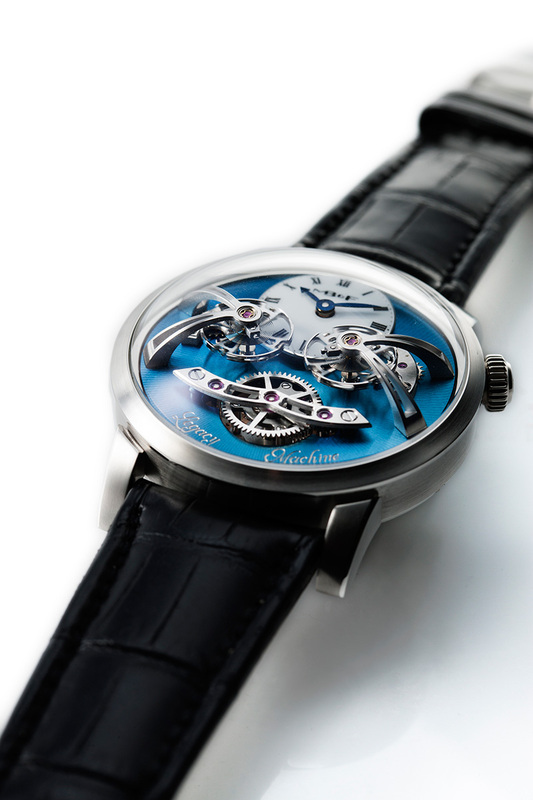 Pricing in USD: $156,000 in red or white gold; platinum LE with blue dial, $190,000.